The great rock wall of Dhaula Dhar where wander those legendary shephardesses, the Gaddi maidens, immediately above Dharamshala rises one of the main spurs of the Himalayas, the dark, pine-covered mountain-side reaching out towards the upper peaks that soar into the regions of eternal snow. 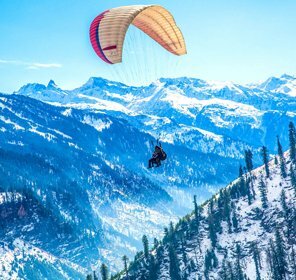 Dharamshala's altitude varies between 1,250 metres (4,400 ft) and 2,000 metres (6,560 ft). The snow line, here, is perhaps more easily accessible than at any other hill resort and it is quite possible to trek upto it after an early morning's start, the glittering rays of the sun fall upon the glossy snow and cast their reflections back in the valley in all the seven colours of the rainbow, beckowning people on. The scene shifts as one approaches Dharamshala, the plains below wear a veil of blue, while the Dhaula Dhar, spur on which Dharamshala stands rises dark and pine covered. 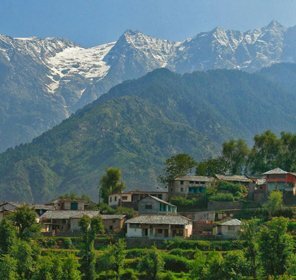 Divided into upper and lower towns with a difference of some metres (1,500 ft) between them against a background of snow-capped mountains, forests of giant conifers meet carefully cultivated tea gardens at the beautiful resort of Dharamshala which stands on the spur of the Dhauladhar range. The mountains enfold three sides of the town and the valley stretches beyond to the south. Know for its scenic-beauty amidst high pine trees, tea gardens and other timber-yielding trees vying with one another for height, calmness and serenity. Now the seat of His Holiness, the Dalai Lama, after the Chinese conquest of his country, when the Tibetan exodus began, they first went to Dalhousie but later shifted their colony to Mcleod Ganj in upper Dharamshala. Dalhousie's loss was Dharamshala's gain. Situated amidst beautiful surroundings, the vast slopes have been developed with flower beds, shrubs and underground electric lighting; all along are stone walks, elegant wooden benches and covered decorated shelters. To add to the beauty, there is an artificial stream flowing through and tanks filled with gleaming gold fish. The Tibetan colony is only 10 km up the hill. Not to be outdone, Hotel Dhaulahar had been built by the Himachal Tourism Development Corporation with a special grant from the Centre, providing among other amenities, a specious glassed dining hall together with a beer bar. Along with the Hotel Bhagsu, the tourist rush will be conveniently met. 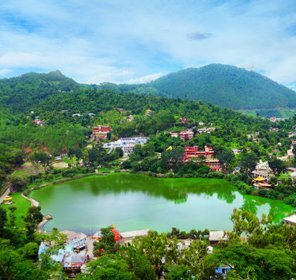 Since 1960, when it become temporary headquarters of the Dalai Lama, Dharamshala has risen to international repute as "The Little Lhasa in India". 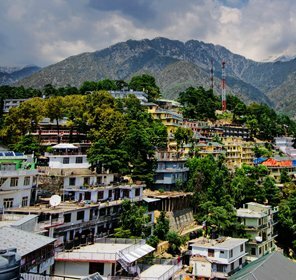 Dharamshala is evocative of imperial days in places like Mcleod Ganj and Forsy the Ganj.Headquarters of the Kangra district, it became the capital in 1852 and is 125 years old. Wrecked by an earthquake in 1905, it rose like a phoenix from the ashes, more resplendent than ever steadily acquiring a pride of place among tourist attractions in Himachal Pradesh. The high altitude, cool and favourable weather have contributed towards the creation of a Tibetan environment. More than 3,000 Tibetans have made Dharamshala their temporary home, living mostly in Mcleod Ganj. After the Indo-Chiness and Indo-Pak wars, the government erected the War Memorial to the hundreds of jawans and officers belonging to kangra, who died in battle.